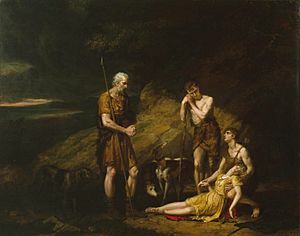 Imogen Discovered in the Cave of Belarius by George Dawe. The Tragedy of Cymbeline is a play by William Shakespeare. It is based on a story in a book called Holinshed's Chronicles by Raphael Holinshed. Shakespeare also used History of the Kings of Britain by Geoffrey of Monmouth about the real-life British king Cunobelinus. Shakespeare also used a story in a book by Giovanni Boccaccio called Decameron for some details. The first known performance was in April 1611. It was first printed in 1623 in the First Folio, a collection of all of Shakespeare's plays. Cymbeline Facts for Kids. Kiddle Encyclopedia.